It was a historical day in the Rose City today. The crowd at Jeld-Wen Field saw the San Jose Earthquakes' striker Chris Wondolowski tie for the most goals scored during regular season (27), a record set by Roy Lassiter during the inaugural MLS season back in 1996. The goal came from a soft penalty kick on a bad call by the referee in response to Steven Lenhart's apparent foul by Donovan Rickets. Regardless of the method, Wondolowski got his 27th goal and will go down in history as one of the most consistent goal-scorers the league has ever seen. He has now been the top scorer in MLS for two seasons: 2010 and 2012 and has amassed 64 goals for San Jose. As for the Timbers, this was a different kind of game. Without a post-season to play for and Cascadia Cup already won, this was more of an exhibition game in which the players kept on performing for the sake of maintaining a high profile on the wake of Caleb Porter's arrival as the new head coach. There was little flow through the middle of the park, with Chara constantly being blocked and Nagbe largely ineffective for long periods of the game. Steve Smith provided a spark on the left side and Bright Dike always looked dangerous, if without as many chances, although his perseverance allowed for Portland's tying goal that left the final score 1-1. The real winner today was the crowd. 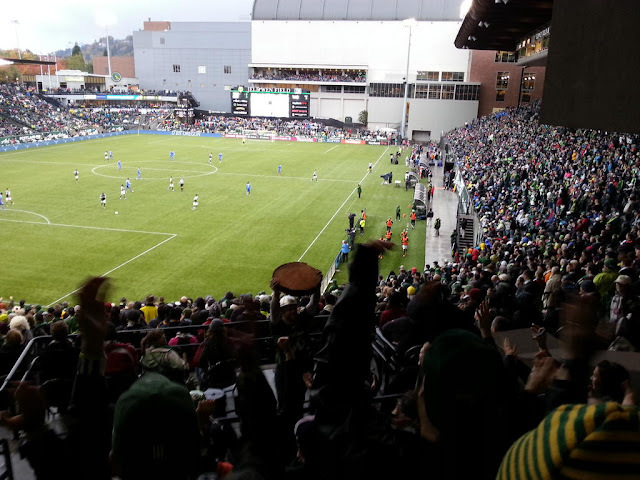 We sat at a completely different vantage point at the stadium today, closer to the Timbers Army. This provided great views of most of the field and kept us dry from the drenching Pacific rains. The best part, as always, was the atmosphere. Every seat was full even though this game didn't matter competitively, even though it rained heavily at times, even though there were a myriad college football games to watch on TV. Jeld-Wen field is a magical place. Outside, its creeping vines rise up the walls above the front gates and turn a pinkish orange tint with autumn. Inside, the crowds smile and you can see babies and children carried by their parents. You also see the more raucous groups belonging to the Timbers Army or the casual group of avid fans. It is a place of diversity where soccer is king. This city, after all, is Soccer City USA. Thanks, Portland Timbers, for another season of memories.